Portions of this review also appear in our coverage of the standard Blu-ray release written by Aaron Peck. Specifically, Aaron penned the Movie Itself and Supplements portions, while M. Enois Duarte wrote new Vital Disc Stats, Video, Audio and Final Thoughts sections. Boy have things in the animated movie world started to change. In the beginning, Pixar seemed to control everything. Not much existed in the way of competition. Sure, some studios like Sony Animation were able to produce some pretty animation, but they were lacking in the story department. Slowly, in the past few years, it seems the competition has started to step it up and give Pixar a little competition, particularly Dreamworks Animation. Enter Despicable Me. Universal Studios has not been a major player in the animated film department up to this point but oh how quickly things can change. Despicable Me was a huge success for the studio, grossing over $250 million, and with good cause. 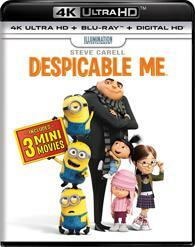 Despicable Me is the story of a mega villain named Gru (Steve Carell). For years, Gru has been the world's greatest villain. He has made his mark by stealing various monuments from around the world and just being generally evil to every person he comes in contact with. All of a sudden, Gru's title as the number one villain has been stripped by a newcomer named Vector (Jason Segel). Vector jumped onto the scene by stealing the great pyramid from Egypt. Gru decides that it's time for him to reclaim the title as number one villain by stealing the moon. To Gru's dismay, the evil bank's president, Mr. Perkins (Will Arnett) tells Gru that they won't fund his heist unless he can first steal a shrink-gun. 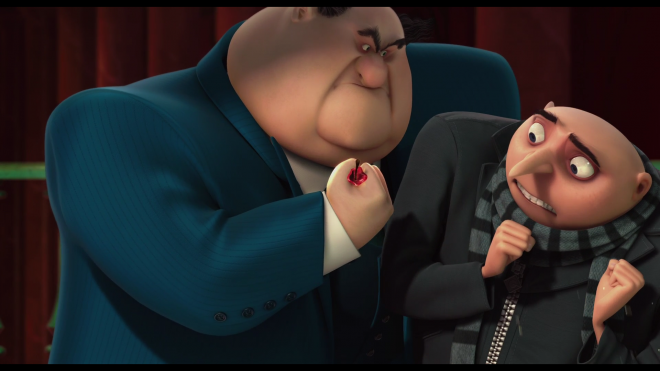 Vector ruins Gru's plan by stealing the shrink gun from Gru right after Gru has stolen it! Gru decides to think outside the box and adopts three girls named Margo (Miranda Cosgrove), Edith (Dana Gaier), and Agnes (Elsie Fisher). 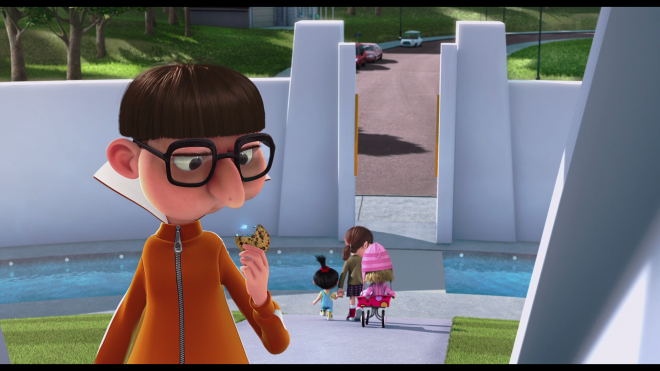 He plans to use their cookie selling ability against Vector by secretly gaining access to his fortress through the girls. As Gru grows fond of the girls, he must decide between being the worlds greatest villain or a great father. 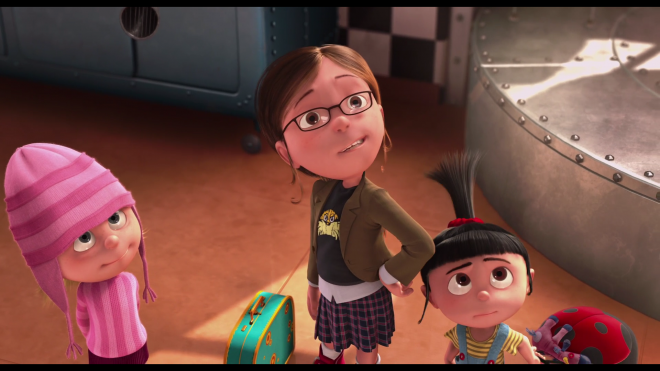 For me, Despicable Me worked because of the great characters. I really enjoyed the growth Gru went through. He started off as a singularly evil person, caring about nothing else but being the best at what he does. In the end, he learns that there is more to life than being the greatest villain in the world. Vector also proved to be a fun supporting character. In the start of the film, I almost found the relationship between Gru and Vector to be like that of Wile E. Coyote and the Road runner, Gru being the former. Also worth mentioning are some supporting characters like Gru's minions and Dr. Nefario (Russell Brand). With all these great characters, it would have been easy for this film to fall apart by trying to do too much with all the great content, but thankfully, a great balance is struck and a great movie is the end product. The voice acting was also very strong. Steve Carell does a great job voicing Gru. He strikes a masterful balance between ruthless villain and caring father. Jason Segal also delivers a solid performance by bringing some great humor to the character of Vector. Also worth mentioning are the performances of Jule Andres as Gru's mom, Kristen Wiig as the orphanage director Ms. Hattie, and directors Pierre Coffin and Chris Renaud as all of the minions. Overall, I found the casting decisions to be nearly perfect. So what makes Despicable Me rank among the top animation films of 2010? For me, it was the excellent story. Children and adults of all ages should easily be able to find something to love about this movie. Kids will love the humor of the minions while adults will enjoy some of the more subtle humor (like the evil bank formerly being called Lehman Brothers). If you haven't yet seen Despicable Me, I would easily recommend checking this one out, you won't be disappointed. Universal Studios Home Entertainment brings Despicable Me to 4K Ultra HD Blu-ray as a two-disc combo pack with a flyer for an UltraViolet Digital Copy. The dual-layered UHD66 disc sits comfortably opposite a Region Free, BD50 disc inside a black, eco-cutout case with a glossy, embossed slipcover. At startup, the disc goes straight to an interactive menu screen with full-motion clips and music playing in the background. The lovable, goofy supervillain and his minions conquer the Ultra HD world with a stunning, jaw-droppingly gorgeous HEVC H.265 encode in Dolby Vision, which defaults to HDR10 for those not yet equipped for the new competing format. Back and forth comparisons also reveal the Dolby Vision version is noticeably better than the HDR10 and the BD with a significantly richer, more vibrant color palette throughout. Reds and greens are unbelievably sumptuous and practically pulsating with life. Meanwhile, the blue in the sky is a bit more vivid and fades into the whitest areas far more naturally than the SDR version, which sadly suffered from some very mild banding. In fact, it's rather shocking now to see how the Blu-ray appears faded and somewhat dull compared to the Dolby Vision. For example, when Gru talks to his neighbor Fred, notice the vibrant yellows bursting against a luminous blue sky and lush green grass. When compared to HDR10, Dolby Vision offers a notably wider array of secondary hues further complimenting an already spectacular picture and giving the overall presentation bit more pop. Sunset skies glow with an arrangement of magentas, creamsicle orange and fiery orange while the faint freckles on Angus and the liver spots on Dr. Nefario are far more apparent and discrete from the rest of the rosy peach skin tones. Viewers can even see the light wrinkles around the eyes of Gru because they're of a slightly darker shade, and Kyle actually shows teal-colored hairs whereas, in the BD, it looks more ash grey. Presented in its original 1.85:1 aspect ratio, the 2160p video also comes with a much brighter but still comfortable contrast, allowing for better visibility of the details. Honestly, the amazing work done in the animation can be better appreciated here than in SDR. While whites maintain a brilliant crispness and true-to-life glow, the fine lines in the furniture and the stitching in the clothing are razor-sharp, giving each item a surprising sense of realism. Improved specular highlights provide various metal objects a lustrous shine and radiance while revealing the tiniest rust spot, dent and negligible imperfection, adding another layer of realism to the image. Interestingly, the white walls in Vector's house glow a bit brighter in DV than in HDR10 as though functioning like florescent lights. Blacks also receive a marked improvement, looking darker and inkier in Dolby Vision than in the BD and HDR10 counterparts. 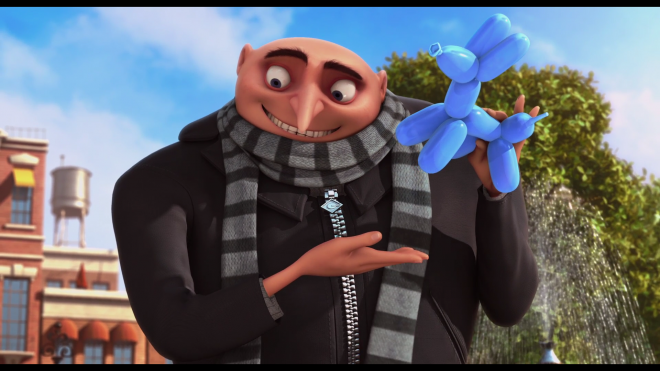 With exceptional gradational differences between the various shades, viewers can better make out the wrinkles and threading in Gru's charcoal-grey jacket. Although the HDR10 version is pretty stunning in its own right, brightness levels seem a tad richer and realistic in Dolby Vision, allowing various leather-made objects to reveal a rough, pitted lifelike texture that further. And in Gru's underground lair, there's better visibility of the every object and piece of equipment in the Nefario's lab without losing the rich, penetrating darkness in the shadows, making this Dolby Vision HDR presentation one of the best and finest currently available. Along with the video, Gru and his family of bad guys try to steal the moon, equipped with a fantastic DTS:X soundtrack that adds a slightly more immersive quality to the comedic action. However, the overall mix is not really all that different than its legacy 5.1 DTS-HD MA counterpart, delivering a wide and spacious soundstage layered with a variety of background activity. Nevertheless, it's an improvement with slightly better panning and directionality. Missiles move from the front of the room to the back flawlessly, debris from explosions scatter in every direction, and other bits of chaos fill the soundscape on numerous occasions. Periodically, some of that commotion discretely travels into the overheads, generating an amusingly effective sense of space and dome-like soundfield. Other atmospherics maintain an appreciable level of ambiance with minor bits of racket occupying the sides and rears. Exhibiting crystal-clear clarity and distinction in the midrange, the movie is continuously filled with action across all three channels, sustaining excellent channel balance and separation and distinction in the music. Off-screen effects convincingly move outside the image and often bleed into the front heights, creating a welcomed half-dome wall of sound. Conversations are sharp and precise, prioritizing Gru's ambiguously Eastern European accent and revealing excellent inflection in the voices of the girls. The low-end is about the same as before with the occasional deep, hearty oomph in explosions and other bits of action. The same set of supplements are ported over, but the "Audio Commentary" and "Mini Movies" are available on the Ultra HD disc in 4K and HDR10. Director and Minion Commentary: Despicable Me features a pretty solid commentary track that should please fans. The main voices you will hear are those of directors Pierre Coffin and Chris Renaud, they are also joined by a few of the minions from the movie. Overall, I found the addition of the minions to the commentary track to be a bit over the top. Sure, they're fun in moderation during the movie but getting them from two angles was a bit much. I would have liked an option to switch the minions off and only hear what the directors had to say. Aside from the minions, I found the commentary to be quite enjoyable. The directors cover a wide range of topics from the production process to some of the challenges that arose making the film. Overall, this is an engaging commentary that fans of the film should enjoy, don't say I didn't warn you about the minions though! Gru-Control: Almost another commentary track for the film, but this one seems to be squarely aimed at the kids. Gru-Control is a picture in picture track that is hosted by the minions. If you are a kid or love the minions, this is the track for you. For everyone else, I would skip this if you wish to continue to think the minions are fun and cute. Minion Mini Movies (UHD, 12 min): As advertised on the slipcover of the film, 'Despicable Me' features mini movies, all of which primarily feature the minions. The first movie features the girls and the minions, they receive a call that the social worker is coming over to see if Gru's place is good for children. The girls and the minions must work together to fix it up before the inspector shows up! The second movie features new minions viewing a training video on what it takes to work for Gru Enterprises. Needless to say, they don't pay attention and chaos breaks out. The third movie is about three minions fighting over a banana that one of them is about to eat. These are fun movies that kids should really enjoy. The Voices of Despicable Me (HD, 17 min): Take a behind the scenes look at the voices behind the characters of Despicable Me. I especially enjoyed the comments by Steve Carell. The World of Despicable Me (HD, 15 min): This feature is a collection of interviews with both cast and crew members from the film. Directors Pierre Coffin and Chris Renaud discuss their thought process on creating every aspect of the film from Gru's house to the contrast between Gru and Vector. Steve Carell provides some great commentary. 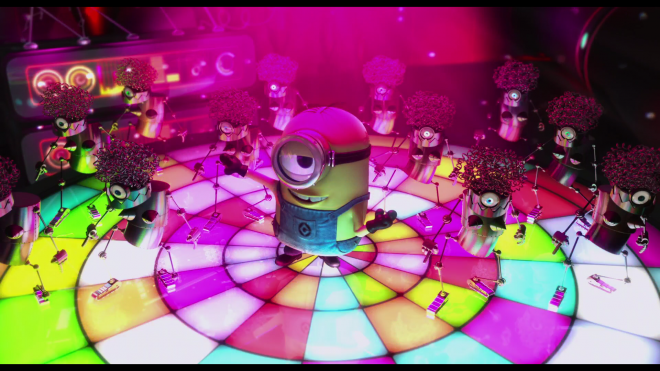 Despicable Beats (HD, 3 min): A behind the scenes look at the production of the music for Despicable Me. A Global Effort (HD, 3 min): The directors show how the production of this film was a global effort featuring offices around the world. Super Silly Fun Land (HD): Three carnival-themed interactive games. The games are called feed the creatures, tin can alley, and freeze the minions. Definitely one the kids should enjoy! Gru's Rocket Builder (HD): Another interactive game, help Gru build a rocket to defeat Vector. Miss Hattie's Top Secret Cookie Recipes (HD): A fun feature to test out if you enjoy cooking. This features five different cookie recipes; the recipes are for: minty mints, choco swirlies, coconutties, toffee totes, and caramel clumpies. Sounds good to me! Pocket BLU: rounding out the collection is Pocket BLU functionality. In my brief experimentation with this feature, I am fairly impressed. It's nice to be able to use your iphone as a Blu-ray remote. Trailers (HD): Two previews for video games are included. Overall, Despicable Me is a fun movie that folks of all ages should enjoy. This is a no brainer for a family movie night selection or just a relaxing sit down for that matter. The Ultra HD Blu-ray does some very bad, bad things with a gorgeous and impeccable picture quality in Dolby Vision and a highly satisfying DTS:X soundtrack. With the same set of supplements, the overall package is enough for the kiddies to enjoy while parents enjoy the excellent 4K presentation.